Since September 2011, Google Voice is the very best way to make free Internet phone calls. With Google Voice, you can make free phone calls, free PC to phone calls (via Google Talk browser plugin), and free PC to PC calls (also via Google Talk). Google Voice is much more than a way to make free phone calls on the Internet. Google Voice is primarily a way to manage the phone numbers in your life and can be used to intelligently route incoming calls to your free phone number provided by Google Voice to any other phone you have. 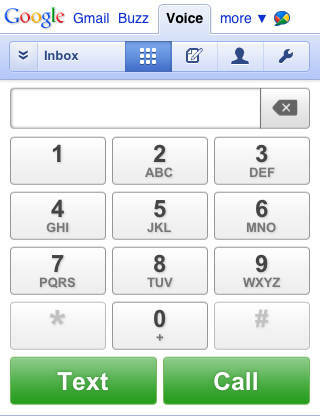 With Google Voice, you can also get free SMS, make a free conference call, and get free voice mail services. Free calls you make with Google Voice must be to numbers in the United States or Canada. Google Voice is available as a web app that you can use in any browser, including mobile browsers (as pictured here). Dedicated apps are available for Android, BlackBerry, and iPhone users. Free phone calls with Google Voice are limited to three hours. However, you can continue to make a free call to the same number over and over again. © 2013 FreeCall Services from Computechnic Digital & Technology HK, All rights reserved.